‘So fear Allah as best you can, and listen, and obey, and spend in His cause; it would be good for yourselves. And whoso is saved from his own covetousness – it is these who shall be successful. As evident from these verses God is drawing attention of true believers to adopt righteousness and abide by His commandments with complete obedience. One general commandment of God is to spend in His cause. A true believer should not hesitate when spending in God’s way because a true believer’s financial sacrifice is for good causes. Today it only the Jama’at of the Promised Messiah (on whom be peace) which spends to seek God’s pleasure and for good causes and indeed is desirous of this. It is only the Ahmadiyya Jama’at which, having accepted the Imam of the age and thus comprehended the spirit of such causes, is implementing them according to the teachings of Islam to discharge rights of God as well as rights of mankind. These works include Tabligh, preparation of Tabligh, publication of literature, publication of the Holy Qur’an, construction of mosques and mission houses, establishment of schools, initiation of radio stations to broadcast teachings of Islam, hospitals and other humanitarian works. Ahmadiyya Jama’at has avoided covetousness of the self and has gained insight of being included among the مفلحون (successful). Indeed the word مفلحون does not simply mean those who succeed. It also signifies those who prosper, attain success, and accomplish their good desires and who wish to live a pleasant life to seek God’s pleasure. Their lives come under the protection of God and their prosperity is enduring, they attain satisfaction from God’s grace and God’s grace is always bestowed on them, here in this world as well as in the Hereafter. They are granted success from God and their success is not limited, in fact it is most expansive. How fortunate are those who attain this! God states that those who spend in the way of God are not merely demanded to spend, rather their spending is a source of their own success and prosperity. God is never in anyone’s debt; He looks at financial giving with love and values it as if a good loan has been given in His cause. And His return is always enhanced and not only this, He also states that owing to financial sacrifice, He will grant forgiveness and will enable people to do more good. We can have not sufficiently comprehend God’s appreciation; some of it can be gleaned from the explanation of the word مفلحون Fortunate are those who attain this beneficence. Today, it is the Ahmadi Muslims who have insight of spending in the way of God and it is they who are recipients of God’s beneficence. These are not just empty words, rather, Hazrat Khalifatul Masih receives hundred and indeed thousands of reports time and again where Ahmadis present their sacrifices with great fervour. How can anyone be fervent if they do not have insight to spend in the way of God? There are also many who, immediately after giving in the cause of God, experience an enhanced return from God. This impacts them to such a degree that they also spend the enhanced return in the way of God and continue to be blessed by prosperity and God’s grace. Below are some incidents of how Ahmadis were enabled to spend in the way of God and how they were blessed. Our missionary from Benin writes about an elderly Ahmadi Salman Sahib from Cotonou who is quite impoverished. He did not have sufficient money for the return fare of CFA franc 1500 for Benin Jalsa Salana last December. When he was urged to attend Jalsa he somehow managed one way fare and went but had to organise the return fare. On his return home Waqfe Jadid representatives visited him to collect the money he had pledged. He received them most cheerfully and when asked for the donation, he gave them CFA franc 6000 which was a huge amount for someone of his means. The Waqfe Jadid representative became emotional and said that he could give less and keep some for his family. But the person replied that God had granted him the money, why would he not give it in His cause? He said the money was a trust from God and explained that he only had the means for one way fare to Jalsa and on his return from Jalsa God bestowed so much on him that he was happy to give. A couple of days later he donated a further CFA franc 2000. Our missionary from Tanzania writes about a new Ahmadi Munope Sahib from a region of the country who accepted Ahmadiyyat two years ago. He has repeatedly expressed that he has seen that whatever is given for Waqfe Jadid and Tehrik e Jadid is returned by God in an enhanced manner. He says we had no idea where our money was spent before coming in the Jama’at but since joining the Jama’at and paying chanda contribution we experience inner peace and our financial situation has improved. Our missionary from Burundi writes about Abu Bakr Sahib who is a new Ahmadi and extremely impoverished. He lives on very little pay and also helps out his parents. When he was approached by Missionary Sahib for Waqfe Jadid, he instantly gave something. He said his father had a wound in his foot and was very ill and had been in hospital for three months and also had some indigenous treatment done but the doctors were considering amputating his foot as there was no alternative. Abu Bakr Sahib came for Jummah Prayers after two weeks and firstly paid the balance of his chanda and started expressing his gratefulness most emotionally. He said after making his initial and little Waqfe Jadid payment he received a blessing that his boss increased his wages and the greater blessing was that his father was now on the road to recovery. Earlier he needed a stick to walk but is now walking independently and all this was a blessing of chanda. He asked to be informed about the prescribed rate of paying chanda so that he could start paying regularly and properly. Sulaimani Sahib from Lindi region of Tanzania writes that he is a shopkeeper and last year his business suffered loss but he did not decrease his pledges for Tehrik e Jadid and Waqfe Jadid and paid up in Ramadan more than he had pledged so that he could become a recipient of the prayers of Hazrat Khalifatul Masih and could get out of financial loss. God so blessed him that at the time he only had one shop which was incurring loss but now he has two shops. Indeed, God states that He never keeps arrears, He always augments returns. A new Ahmadi from Mtwara region of Tanzania, Shangoay Zuberi Sahib says I joined the Jama’at but then I left it. Owing to the efforts of the local Mu’allim (teacher) I returned to the Jama’at. When I was outside the Jama’at I used to find it difficult to make ends meet and suffered loss every day. I had a bicycle and a small business of selling utensils and at times did not sell anything whole day long. However, since I have re-joined the Jama’at and have started paying into various financial schemes, quite soon my financial situation improved. God so blessed my chanda paying that I have now replaced my bicycle with a motor cycle and am a lot better off than previously. Our missionary from Brazzaville, Congo writes that an impoverished Ahmadi friend Aalipa Sahib works as a labourer and pays his chanda each month. He says that when we announced Waqfe Jadid chanda he only had franc CFA 2000 and had no job. He went to the mosque and offered two Nafl Prayers and gave the franc CFA 2000 that he had to his Sadr Sahib. He says in the evening someone sent me franc CFA 20,000 as payment for a job I had done for him a while ago but he had not paid me. He says that he feels that by virtue of him paying chanda God compelled the man to pay him and thus blessed him ten-fold. Our missionary from Benin writes that an Ahmadi Kanday Sahib who belongs to Gogoro Jama’at took Bai’at recently and immediately started paying chanda. He feels an extraordinary change within him. When he was asked for Waqfe Jadid chanda he gave most eagerly and said since I have started giving chanda, with the grace of God, my business is flourishing and whatever I do is being blessed extraordinarily and I feel this is all due to coming in the fold of Ahmadiyyat and the blessing of paying chanda. Our missionary from Kinshasa writes about Ibrahim Sahib who runs a livestock business of sheep and goats. Prior to accepting Ahmadiyyat his business was not doing very well and there was no profit. After accepting Ahmadiyyat, he started paying chanda according to his means. His business improved with the blessing of chanda. He acknowledges that it is all due to the financial sacrifice he made after joining the Jama’at. Missionary from Kinshasa, Congo writes about Mustapha Sahib, resident of M’banza-Kongo who took Bai’at in Ramadan. His Christian sister was ill in those days and a large amount was spent on her treatment. When he heard about financial sacrifice at the mosque he paid his chanda contribution and also paid on behalf of his sister with request for prayers for her recovery. His sister regained her health and he says it was all due to the blessings of making financial sacrifice in the way of God. Ameer Sahib of Mali writes that Muhammad Jara Sahib was quite impoverished before he started paying chanda to Jama’at but ever since he started making chanda contributions his situation has improved. With the grace of God many Ahmadis are make great financial sacrifices in Mali. Recently Daud Salif Sahib who is a mechanic of small means started paying franc CFA 1000 weekly. This blessed his work and his sincerity so much that a few days ago he contributed franc CFA 153,000 which is approximately equivalent to £200. With the grace of God new Ahmadis are increasingly inclined to contribute to chanda and are now paying with great sincerity. A sincere member of Jama’at Afafa Sahib pays franc 150,000 every month which is equivalent to £200. These are very large sums of money for those under-developed countries. He also paid franc 250,000 Zakat, which is approximately equivalent to £330 and with the grace of God is increasing in faith and sincerity. Inspector Sahib of Kashmir India writes that last year almost all Ahmadi homes in Sri Nagar were affected by the recent floods. There was so much water during September floods that even two-storied houses were submerged. He says when he went on his tour of Sri Nagar he was concerned that he would not be able to make 100% collection due to the situation. People were compelled to live on their roof tops as their homes were filled with mud and the situation was terrible. However, when people saw him, they themselves spoke about chanda and he was delighted that they happily paid their balances. In spite of the suffering their faces had no negative expression and with the grace of God the budget of Sri Nagar was accomplished. One’s eyes well up experiencing this and one is reminded of the time of the Companions (may Allah be pleased with them all) of the Holy Prophet (peace and blessings of Allah be on him) who had nothing to eat but would excel in making sacrifice. It is a fact that seeing the dear Jama’at of the Promised Messiah (on whom be peace) is faith-rousing. Our Mu’allim from Benin writes that a new Ahmadi used to pay chanda regularly with the intention that his family also accepted Ahmadiyyat. He says he saw a dream that due to the blessings of his chanda his entire family accepts Ahmadiyyat. The dream inspired him to do Tabligh to his family which he previous did not do but started after the dream. Along with Tabligh he also started contributing chanda specifically for this reason and now felt pride in saying that his entire family had accepted Ahmadiyyat and this happened merely due to the blessing of making financial sacrifice in the way of faith. A lady from Benin says that last year whatever she did incurred loss and nothing got done. Mu’allim Sahib drew her attention to paying chanda honestly and regularly. She thought she would try it out and see what would be the benefit of paying according to her income. She says when she started paying properly and regularly her business took off and now there is prosperity in the family and everything is falling in place. God’s promise that He gives abundantly to those who spend in His way is true! Inspector Qamar ud Din Sahib from India writes that he visited Kerala at the start of the financial year to make Waqfe Jadid budget. He met a 26 year old young man who said he had recently studied interior decoration and was about to start business with his father. When he was told about the importance of Waqfe Jadid chanda he put down Rupee 2 Lakh (200,000) as his contribution and said he had only just started work and wondered how he would pay up. Inspector Sahib asked him to write to Huzoor for prayers and said that he too would write. When he returned for collection the young man was delighted to tell him that he had received many contracts from banks for interior decoration which had blessed his income. He paid off his entire contribution. Naib Nazim Maal Waqfe Jadid India writes that when he went on a tour of Utter Pradesh he met Muhammad Fareed Anwer Sahib, secretary maal Kanpur. He paid up his pledge Waqfe Jadid contribution and invited Naib Nazim Sahib to his house in the evening. There he told Naib Nazim Sahib that his eight year old daughter Sajeela had been waiting for him for two days. Sajeela quietly went in and brought her money box. She gave it to Naib Nazim Sahib and said she had saved money all year round for chanda. She asked him to take the money and give her a receipt. The money box had Rupee 735. He was amazed to see the eight year old who is also a Waqfe Nau member. She had herself pledged for Waqfe Jadid and paid more than she had pledged. Ameer Sahib of France writes that when a friend was told about Waqfe Jadid he gave whatever he had. His family told him to keep something back to run the household. But he said he had pledged the amount and was going to pay it under any circumstances. He said God would look after the household. The following month he received a letter from the governmental health department saying that in light of his medical report they had decided to pay him expenses for two years and had despatched money for three months. When he saw the amount it was 100% more than what he had paid for Waqfe Jadid. With His grace God brought to fruition his financial sacrifice within a month! Secretary Tehrik e Jadid UK Lajna says that a local secretary Waqfe Jadid told her that a lady of very meagre means who could not pay chanda but had nonetheless pledged whatever she could. After pledging she started praying to God to enable her to fulfil her pledge. The lady knows how to sew and soon after she started receiving sewing orders. Not only was she able to fulfil her pledge now she also has a good income so she increased her pledge. UK Lajna has not only met its target in Tehrike Jadid and Waqfe Jadid with great courage and hard work but has also, with the grace of God, contributed much more than their target. Ameer Sahib Benin writes that the Fulani tribe lives in the north and centre of Benin in large numbers. In recent years Bai’ats took place among this tribe. Three villages of the tribe came under the influence of intense enmity of the local Maulawis and drifted away. A Mu’allim belonging to Fulani tribe from Burkina Faso was sent to Benin so that he could meet up with the people and allay their misunderstanding. He worked in the area for a month and with the grace of God the three villages came back into Ahmadiyyat with increased faith. The villages spent large sum of personal money on transport and went to Benin Jalsa on buses. On their return from Jalsa it was not long before the Mu’allim went to their villages and gave them Huzoor’s message that he wished to involve new Ahmadi in financial sacrifices, even if they gave a little. He told them it was December, the last month to pay Waqfe Jadid. Although they had just spent a lot of money on travel to Jalsa and their means were limited but they had fervour for faith and as soon as they heard this all three villages participated in Waqfe Jadid chanda. More or less one thousand Bai’ats were made in this tribe. These were come incidents of the fervour with which people contribute to chanda. We observed in many instances how God also returns their sacrifice augmented. He is God of true promises and while this shows the truth of His Word it also shows His support and succour for the Jama’at of the Promised Messiah (on whom be peace) no matter where in the world it may be. It has been explained before that Hazrat Khalifatul Masih IV (may Allah have mercy on him) took the scheme of Waqfe Jadid outside Pakistan to meet the needs of India and African countries. Previously not much emphasis was given to Waqfe Jadid outside Pakistan. Monies collected from European or the developed countries are now used in Africa. With the grace of God currently 95 mosques are under construction in 18 African countries. Some of these mosques are quite large because numbers of Ahmadis is increasing there and avenues of Tabligh are opening. The Promised Messiah (on whom be peace) also said that build a mosque wherever you wish to introduce Islam. This work is being carried out in countries other than Africa. Currently there are some 25 countries including African countries and 7 other countries where 204 new mosques have been built and 184 mission houses have been built. About 80% of Waqfe Jadid contribution of European and Western countries is spent in African countries in spite of African Ahmadis making huge financial sacrifices. However, their needs are increasing as are Bai’ats. Since the new Ahmadis are of meagre means in spite of increased number of Bai’ats they cannot fully meet the expenses. They need help in any case. As the incidents showed they are making great sacrifices but the opponents are also creating trouble as a couple of instances showed how they try and influence new Ahmadis and distance them. Some who are weak do drift apart but then there are those with such strong faith who do not care about anything. Huzoor had told the Jama’ats that constant contact should be maintained with new Ahmadis and these contacts should be strengthened. Visit them frequently so that if any Tarbiyyat issues come to light they can be addressed. There are many areas in African countries which are distant and remote and jungles have to be crossed to reach them. Strong contacts cannot be maintained there or are difficult to maintain and there is no connection with new Ahmadis for long periods. There is also a shortage of Missionaries and Mu’allims who could frequently visit, even if with difficulty, and maintain connections but as there are not enough of them visits do not take place. Due to this many Bai’ats are lost. Jama’ats in these countries should at least work on maintaining connection for the first year. This is why Huzoor had told Jama’ats in the first year of his Khilafat that numerous Bai’ats were lost and at least 70% of lost Bai’ats should be restored through re-establishing contacts. With the grace of God Jama’ats did make efforts especially in Africa and when contacts were made people complained that they were abandoned after Bai’at. Many had remained Ahmadi at heart but did not know teachings of Ahmadiyyat and lacked Tarbiyyat. With the grace of God hundreds and thousands were reconnected and their Bai’ats were restored and now active Tarbiyyat work is being carried out though it needs to be made better. In terms of restoring connections Ghana has worked very well followed by Nigeria. Tanzania is lagging behind and needs to try to restore their connections. It is said a lot of Bai’ats took place there as well. They should find all the people who took Bai’at. Twenty years ago or more when the situation in Bosnia deteriorated many Bosnians went to Germany. It is said that about 100,000 Bosnians took Bai’at. However, when they went back to their homeland, connections were lost! In this regard there is a need to make efforts to reconnect with people here as well. It is also said that Bai’ats took place in western Bengal, those people also need to be found! Strong connections are made when new Ahmadis are included in financial giving system. Along with development of faith it also builds strong connection with the administration of Jama’at. This is why Huzoor has always encouraged including new Ahmadis in Tehrike Jadid and Waqfe Jadid. Some Jama’ats are very active in this regard but others are lagging behind. Even if someone pays 10 pence towards chanda it should be accepted and they should be included. With the grace of God each year there is an increase in the number of those who make financial sacrifice, however, it is not as much as it should. This year the contributors to Waqfe Jadid have increased by 85,000 which is mark of the progress of the Jama’at. However, if number of Bai’ats is kept a benchmark the increase in contributors should have been more than 110,000. Progress is indeed with the grace of God but there is room for improvement. Jama’ats will be given new targets in terms of increasing contributors for the next year and Jama’ats should pay full attention to this. With the grace of God, the concern is not how expenses will be met. It is God’s promise that He will meet our needs and He will fulfil it. What we need to work on is to enhance the spirit of sacrifice amongst ourselves. Office-holders should try in this regard and also pray for it as well as other Ahmadis. Continue with the venture to restore connections. The pious-natured who God wishes to save will definitely return and if the weaker ones drift away we need to have compassion for them that they gained and then lost God’s blessing but we are not worried about our numbers decreasing. The Promised Messiah (on whom be peace) gave more emphasis to have sincere Ahmadis with faith rather than Ahmadis in great numbers. Announcing the new year of Waqfe Jadid Huzoor said its 57th year completed on 31 December 2014 and the 58th years commenced on 1 January 2015. Last year Ahmadiyya Jama’at worldwide was enabled to offer financial sacrifice of £6,209,000 which is an increase of £731,000 from the year before. Pakistan stands first as ever. Last year UK came first. After Pakistan, it is the UK, USA, Germany, Canada, India and Australia. With the grace of God a lot of work has been done in Australia as regards increasing contributions as well as increasing number of contributors. After Australia is Indonesia, Dubai, Belgium and an Arab country. In terms of currency Australia has made a significant increase, their increase is 123%. Canada has increased by 21% and India 16% or about 17%. USA stands first as regards per capita contributions with £70 per head. Switzerland at £59 per head, Australia at £56 per head, UK at £51 per head followed by Belgium, France, Canada and Germany. In terms of increase in contributors Mali, Benin, Nigeria, Burkina Faso, Gambia and Cameroon are worthy of mention. As regards contributions Ghana came first among African countries followed by Nigeria and Mauritius. In Pakistan as regards adult contributors Lahore was first followed by Rabwah and then Karachi. In terms of districts the positions were as follows: Rawalpindi, Faisalabad, Sargodha, Gujranwala, Gujrat, Umerkot, Multan, Hyderabad, Bahawalpur and Peshawar. Among Atfal contributions following were the first three Jama’ats: Lahore, Rabwah and Karachi. District-wise the positions were: Sialkot, Rawalpindi, Faisalabad, Sargodha, Gujranwala, Narowal, Gujrat, Umerkot, Hyderabad and Dera Ghazi Khan. The first ten Jama’ats in UK were: Birmingham West, Raynes Park, Fazl Mosque, Gillingham, Worcester Park, Birmingham Central, Wimbledon Park, New Malden, Hounslow North and Cheam. Following were the first few regions in the UK: London, Midlands, Middlesex, Islamabad, North East and South. The first few small Jama’ats were: Spen Valley, Bromley & Lewisham, Scunthorpe and Wolverhampton. The first ten Jama’ats in USA were: Silicon Valley, Detroit, Seattle, York, Harrisburg, Los Angeles, Boston, Central Virginia, Dallas, Houston and Philadelphia. The first few Jama’ats in Canada were: Edmonton, Durham, Milton, George Town, Saskatoon South and Saskatoon North. In India the following regions were prominent: Kerala, Jammu Kashmir, Tamil Nadu, Andhra Pradesh, West Bengal, Orissa, Karnataka, Qadian, Punjab, Utter Pradesh, Maharashtra, Mihar, Lakshidi and Rajasthan. In Australia the first ten Jama’ats were: Blacktown, Melbourne, Mount Druitt, Adelaide, Marsden Park, Brisbane, Canberra, Perth, Tasmania and Darwin. 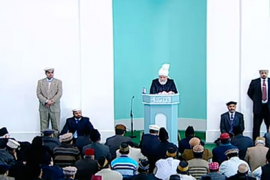 Huzoor urged for prayers for Ahmadis of Pakistan. For the past few days our opponents are trying to create problems in Rabwah. May God protect every Ahmadi from their evil and may He rebound their evil back on them and Rabwah’s peace and security is maintained. May God also give sense to the authorities and the government to control the situation appropriately! Prayers should also be made for Muslims living in the world and in Europe. An atrocity has taken place in France in the name of Islam and the Holy Prophet (peace and blessings of Allah be on him) although it did not have anything even remotely to do with teachings of Islam. As we always maintain and prove that to take the law in one’s own hands and kill and murder someone in this manner has nothing to do with the teachings of Islam. Yet so-called Muslims and Muslim organisations do not desist from their misdemeanours and atrocities. Muslims living here in Europe and Western countries could face a backlash from the local people. Not only that, the publication whose editors and others were murdered brutally could react along with others and rest of the press and attack the person of the Holy Prophet (peace and blessings of Allah be on him). May God enable the governments here to try and contain people from erroneous reactions and apprehend the perpetrators and punish them through judicial process! If there is a backlash, Muslims who have no one to guide them will also react erroneously and thus chaos will carry on and there is danger it may escalate. Today members of Jama’at Ahmadiyya should pray for both sides to desist from excesses. Similarly, Durood should be recited in abundance during these days. Those who can create peaceful environment within their sphere should make efforts for it. May God save the world from chaos and may the chaotic situation soon change into peaceful situation!